Team Flakes Four Grains for Flavor Ad 1965 This is a September 3, 1965 advertisement. It is a nice color ad from National Biscuit Co , makers of Team Flakes. It reads, Discover team Flakes, the first cereal to blend four grains for flavor. Shows a family at the table enjoying this cereal. In mint condition. Photo is taken through plastic and may show wrinkles or crookedness that is not in the ad. This magazine tear sheet measures 10 1/4"" wide by 13 3/4"" tall. 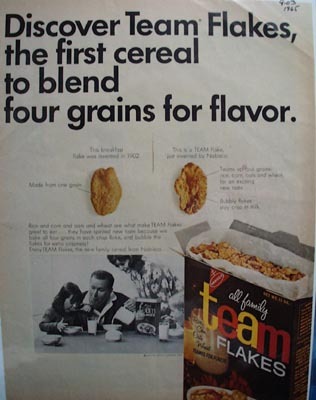 Items Similar To "Team Flakes Four Grains for Flavor Ad 1965"